✅ REMOVES CANTAMINATION WITH MINIMAL DAMAGE! 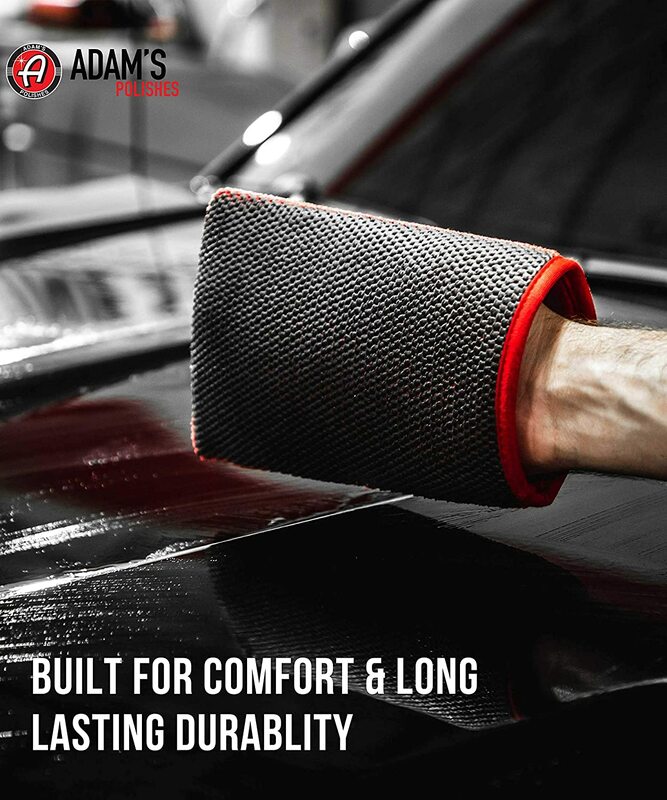 - The Adam's Clay Mitt allows any person who is detailing their vehicle the option to clay the entire car in a fraction of the time. A Traditional clay bar typically takes 2 hours but with this newly designed mitt, claying your vehicle becomes a lot easier. 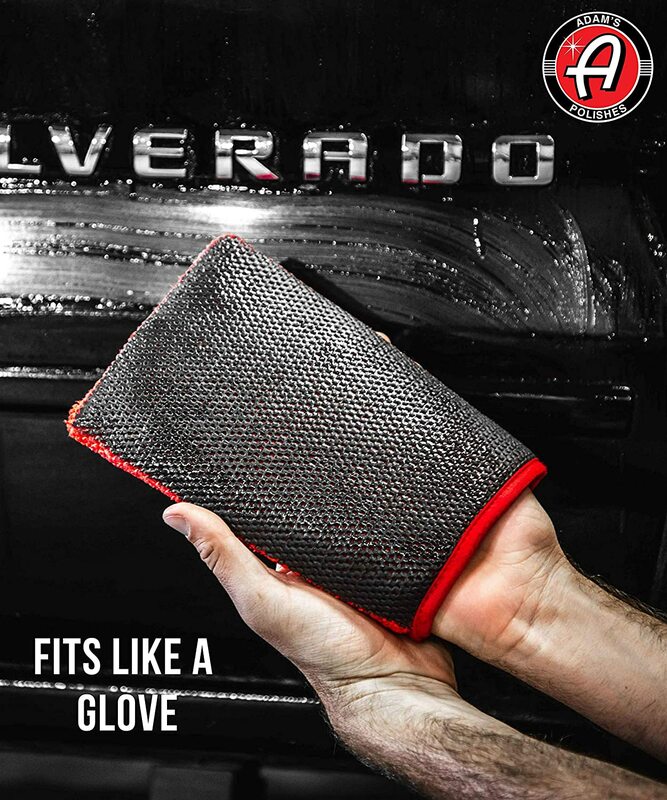 This clay mitt is made with medium grade clay material (Moya and Microfiber) that is slightly more aggressive than our Visco Clay Bar. ✅ USE ON PAINT, GLASS, WHEELS, AND MORE! 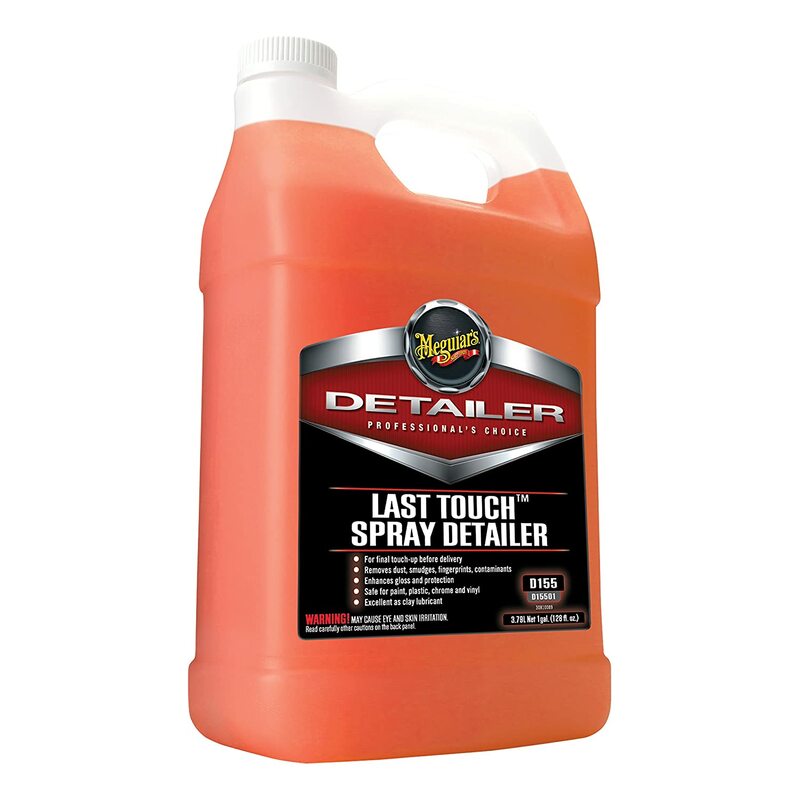 - It will effectively remove heavy contamination such as paint over spray, heavy water stains, ferrous powder, pollen, bugs, effects of acid rain, industrial fallout, rail dust, exhaust and catalytic converter particles and so on; however, it could potentially leave light micro-marring to the surface that would then be corrected when polishing the vehicle for a silky smooth finish. 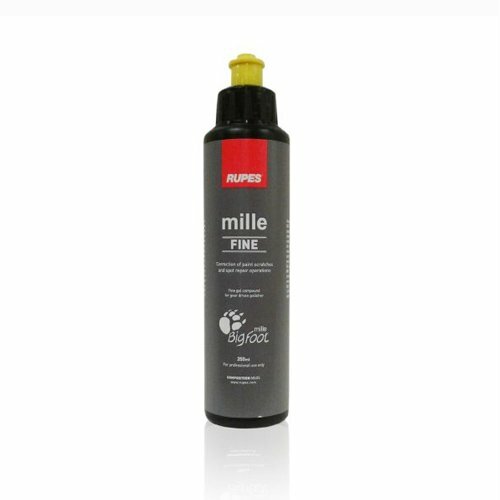 ✅ BEST USED WITH DETAIL SPRAY! 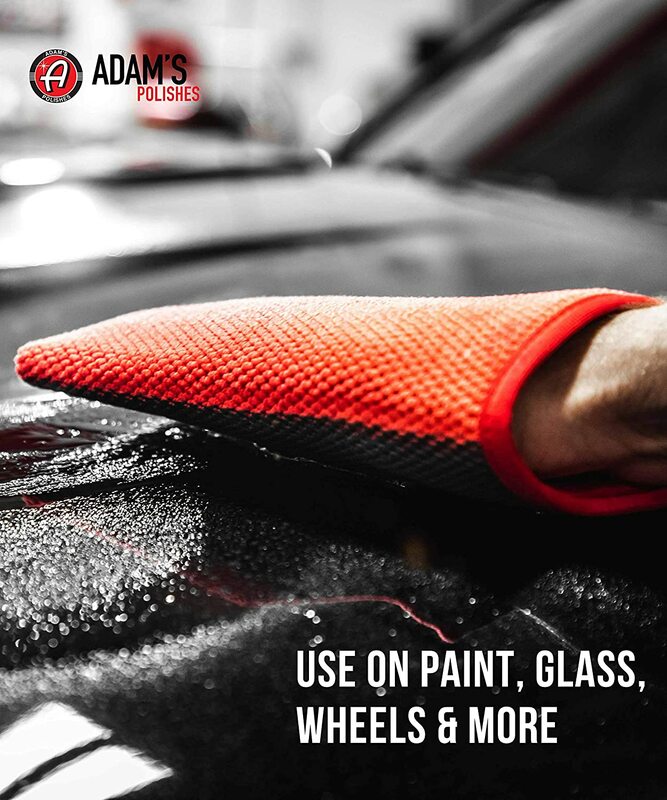 - Using the Adam's Detail Spray is still the preferred method during a clay/decontaminating process, which acts as a clay lubricant, drying aid, and as a quick detailer to a quickly boost car polishes! Adam's Detail Spray provides a slick surface for the mitt to glide smooth with minimal damage or marring to the clear coat. This clay mitt can be used on paint, glass or windows, plastic wheels, and chrome. 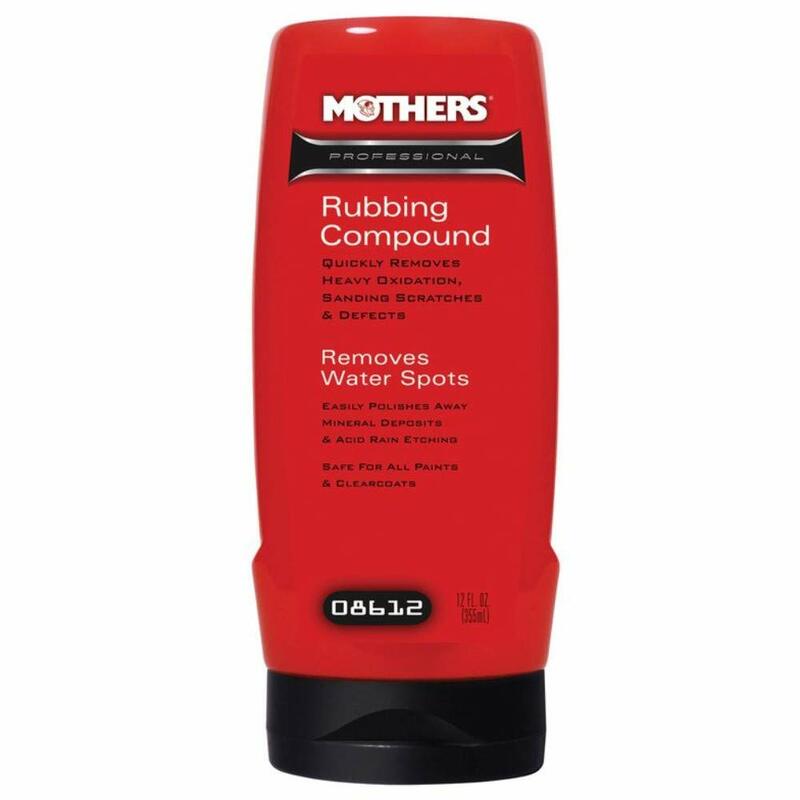 ✅ BUILT FOR COMFORT AND LONG LASTING DURABILITY! - The high-quality materials provide the clay mitt with great tenacity and stickiness, which ensures the clay mitt will last for 5-6 times longer than the traditional clay bar. This clay technology can be cleaned with water and reused multiple times on more than one vehicle. The larger surface area of the mitt allows for a faster use. 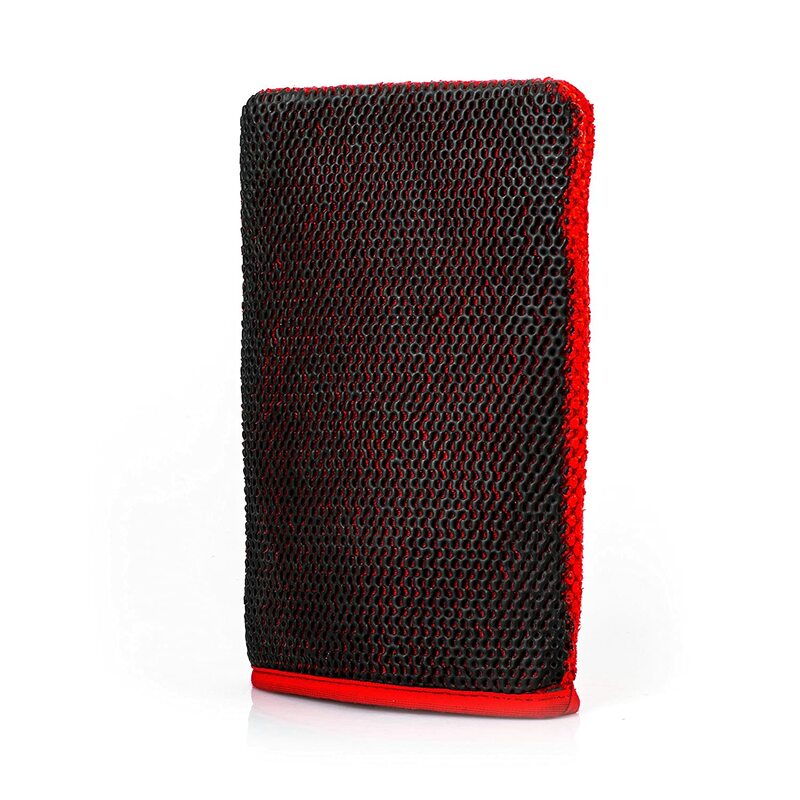 The mitt design fits snug on your hand to prevent from falling to the ground. ✅ 110% SATISFACTION GUARANTEE! - We pride ourselves on customer service and satisfaction and believe that this is THE BEST automotive Clay Mitt on the market! If you don't agree, we'll do everything we can to make it right. Adam's new Clay Mitt is a quick way to remove bonded contamination from your paint when you are planning to do a full detail afterward. This clay mitt is a medium grade clay material that is slightly more aggressive than our Visco Clay Bar. 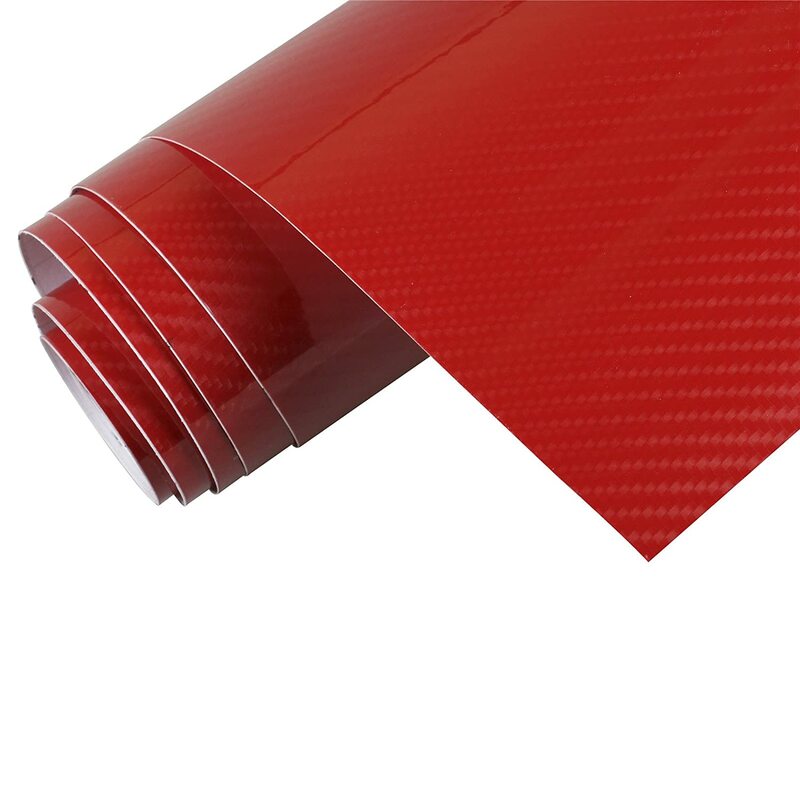 It will effectively remove contamination such as paint over spray, industrial fallout, rail dust, exhaust and catalytic converter particles, and so on; however it could potentially leave light micro-marring to the surface that would then be corrected when polishing the vehicle. 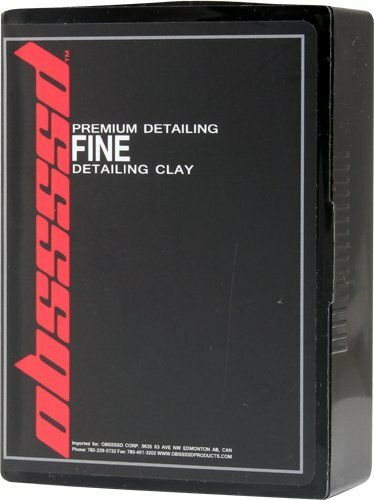 Adam's Clay Mitt is ideal if you are planning on doing a full machine polish of the vehicle afterward. Using our Detail Spray as a lubricant for the clay is still the preferred method for contamination removal. Adam's Detail Spray provides a slick surface for the mitt to glide smooth with minimal damage or marring to the clear coat. 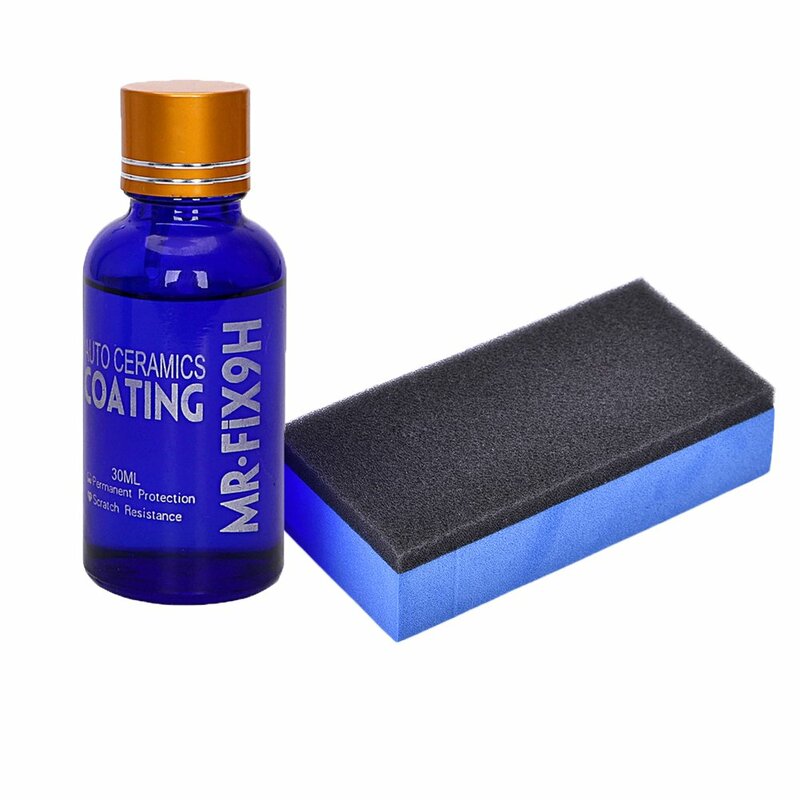 This clay mitt can be used on paint, glass, wheels, and chrome. This clay technology can be cleaned with water and reused multiple times for multiple vehicles. The larger surface area of the mitt compared to our Visco Clay Bar allows for faster use, and the mitt design ensures that you will not accidentally drop the mitt onto the ground during use, which can occur with a clay bar. 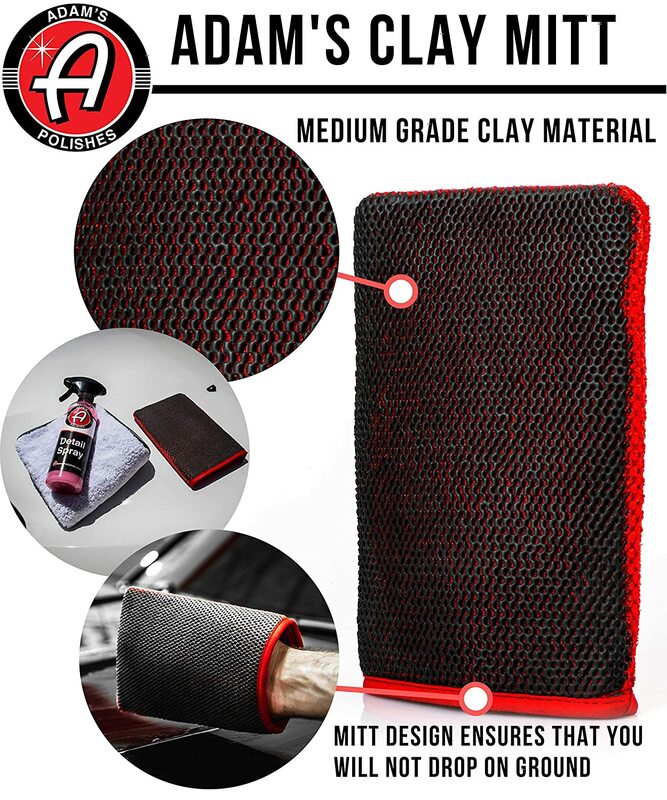 If you're doing frequent paint corrections on multiple vehicles, we think you'll love the new Adam's Clay Mitt!